It’s bad enough they are misleading, and usually more advertising than factual information, but you also need special glasses to read them. The nutrition labels on products are written with a minuscule font and often times covered up by the price tag. In the West, processed foods have been part of the food culture for decades, here in India we catching up quickly — the number and variety of packaged and processed foods has mushroomed over the last few years. Now it is even more vital to dig in, read the label, and find out what you are buying. So get a magnifying glass and brush up on some nutrition basics. In general, while reading the Nutrition Facts Labels, you should look for foods that are high in fiber, vitamins, and minerals and low in sugar, sodium, cholesterol, and fats (especially saturated fat and trans fat). Here’s what to look for in the nutritional facts. 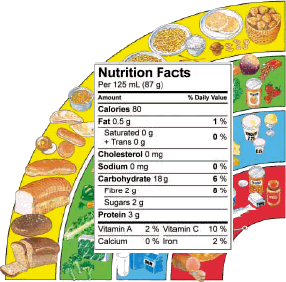 Serving Size — the nutrition label is based on a certain serving size, usually 100 grams. Be especially careful when there is more than 100grams in the packet — you need to multiply the amounts. If your kids ask you why maths is important — you can give this reason. Calories and Calories from Fat — Calories are part of all foods and you need them to live, but you don’t need calories from fat. Not more than 10% of the calories should be from fat calories. Percent Daily Value -Very few know their personal daily calorie requirement, let alone knowing what how much of each nutrient they should have every day. A label on a product that says you are getting 40% of daily requirement of potassium, may have 80% of calories from fat. Although fat is necessary for the body you still need to keep the limits in check. Remember that the particular food product is not the only one you will be eating for the day. Most all charts follow the 2,000 daily calorie requirement model. Most active 20-30 yr olds need 2,000-3,000 calories. Again, do the math. Sodium — Most processed foods are packed with sodium since it is a type of preservative. Check the amount. To give you an idea — the daily dietary recommendations of salt is only 6-10 grams. But Indians have around 20 grams per day in their normal diets. Check the label and you will be surprised at how much sodium packaged foods have! Work out the number of servings of the whole packet and how much of it you will be consuming. Then figure out how many calories and fat calories it has. Check out what type of fats are used. Check out the story on fats here. Nutritional labels come in handy to get an idea of what you are eating and how it fits in to your daily diet but don’t get obsessed with them, especially if you have packaged foods rarely in the first place. You don’t have to give up the stuff you like that’s bad for you — you are allowed to have everything in moderation.